Brief Synopsis – Two high school students who have their own local cable show are offered a chance to be on network TV, but the price they would have to pay might not make it worth their while. My Take on it – Being in high school in the late 80’s/early 90’s, I was an adamant fan of watching Saturday night Live every Saturday Night at 11:30. One of my favorites skits were the one’s featuring Dana Carvey and Mike Myers and Garth and Wayne on a spoof of a local cable access show where two teenagers talk about rock ‘n roll, their friends, their parents and of course girls and women. Being that these skits were so popular, it was inevitable that they would eventually make a movie based on the show. The premise works well because it basically is how would life change for the duo if they were to be broadcast from a studio instead of Wayne’s basement. The transition of the skit from TV to film works mostly because it’s able to take us out of their basement and show us what life is like for them in the “real world”. This gives them the opportunity to add so many pop culture references to the movie (which became a staple for Myers’ Austin Powers series) and makes us laugh over and over. The characters themselves are quite fun to be around but being with them for 90 minutes is a bit tiring because it feels as if they need to stretch things a bit. In the end, the skits are better, but this is still fun to watch. 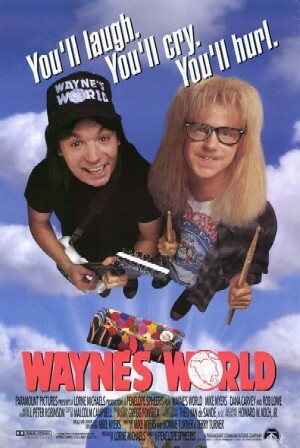 Bottom Line – Wayne & Garth really were a staple of SNL and it makes sense that they would be the best choice for a feature film. The transition from TV to Film works well due to the plethora of pop culture references and cameo in the movie. The characters are fun to be around but 90 minutes is more than enough. It all works so much better in the skits, but this is still quite entertaining to watch. Recommended! I don’t think it’s held the test of time quite as much as SOME comedy movies but undoubtedly one I’d happily watch on TV 🙂 nice review Rob! This movie has such a fond place in my heart because it was a favourite when I was a teenager.